Welcome back! 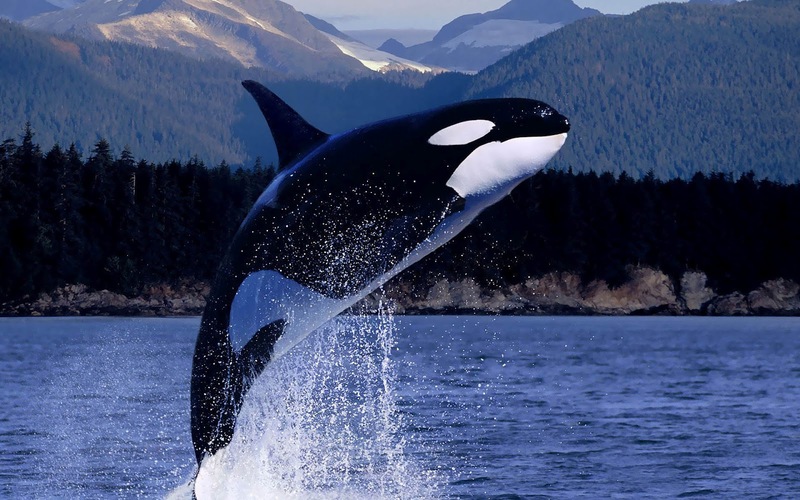 It’s now Day Five of Orcas Week, our annual celebration of exceptional crosswords from 2014. 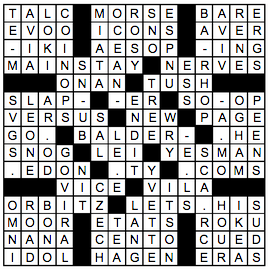 Today we present the award for Best Gimmick Crossword, a puzzle that employs a unique twist or novel concept. You’ll see today’s nominees and winner after the jump. With the exception of Best Crossword, there are traditionally five nominees for every Orca. 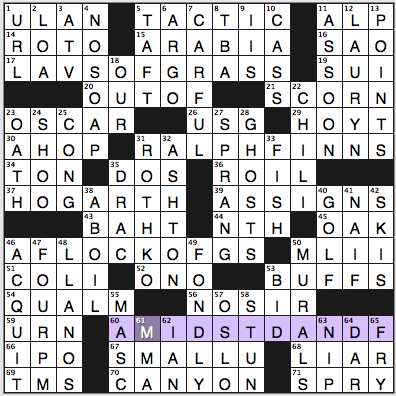 (The number of Best Crossword nominees always matches the number of Academy Award nominees for Best Picture.) But this year there were so many great gimmick crosswords that we are bending the rules with seven nominees for this award. So let’s get to it. Eeeeeevil, by Matt Jones (Jonesin’ Crossword, March 11). We’ve seen puzzles that completely omit a common letter before (notice there isn’t a single E in the grid even though it is the most commonly used letter in our language). Sometimes the puzzle will take the next step of omitting that same letter from the clues as well. But this puzzle goes even one step further by adding unnecessary E’s to the clues. So you’re supposed to delete the E’s from each of the three theme entries in the grid, and you have to delete all of the E’s from the clues in order for them to make sense. Nice! The theme entries here were LAVS OF GRASS (a variation of leaves of grass with the clue [Bathrooms brimming with lawn clippings? ]), RALPH FINNS (a play on Ralph Fiennes clued as [Scandinavian fans of Wiggum’s kid (in Simpsons-iana)? ]), and A FLOCK OF G’S (an e-less variety of a flock of geese clued as [Thousand dollar bills that fly and roost?]). Notice the theme entries omit one, two, and three E’s as you proceed down the grid–an easy-to-miss but elegant touch. But the real highlight was the E-ddition in the clues. One clue, for instance, reads [Toepieces of discussion]. Only when you remove the E’s do you get [Topics of discussion], a sensible clue for POINTS. Likewise, [Folks who Owen Meany films, say] is really [Folks who own many films, say], an apt clue for BUFFS. That you have to change the capitalization and spacing sometimes just makes the wordplay that much more enjoyable. This puzzle raises the bar for both “remove a letter” and “add a letter” themes all at once. Draw Swords, by Brendan Emmett Quigley (American Values Club Crossword, March 26). The trick here was realizing that three of the long Down answers require you to “draw S-words” in the shape of an S, as the screenshot nicely illustrates. 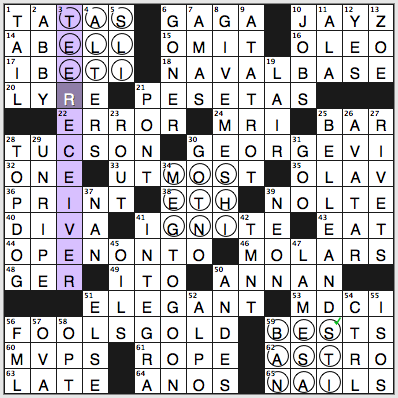 Thus, for example, the clue for 5-Down is [DirecTV device (with sword drawn)]. The answer, SATELLITE RECEIVER, has it’s S-word (SATELLITE) drawn in the shape of an S, with the balance of the answer then continuing down. The same happens with the answer to 8-Down, GIVE ME SOMETHING TO GO ON, with the SOMETHING drawn in an S-shape. And then there’s the S-shaped SEBASTIAN in BELLE AND SEBASTIAN. Importantly, those S-shaped words fit nicely with the crossing Across entries. This is a brilliant concept executed by one of the finest in the business. Were there no byline, you could still guess this is a BEQ puzzle, what with TMNT, FML, all the music clues, and TATAS. It has the hipster, edgy vibe that we expect from Brendan’s puzzles. With 11 five-star ratings and an impressive 4.75 average, it was one of the ten most popular crosswords from the year among our readers. Untitled, by Andrew Reynolds (New York Times, April 1). April Fools Day practically begs for a gimmick, and the New York Times did not disappoint with this “Schrödinger on Steroids” offering from Andrew Reynolds, just his fourth for the Times. There’s a hint of the gimmick in 17- and 56- Across: BEST THREE / OUT OF FIVE. And the central entry at 37-Across uses the clue [Winner of the wager in 17-/56-Across, depending on how you fill the circled squares in this puzzle]. The joy is that you can use either HEADS or TAILS and get a completely correct puzzle. 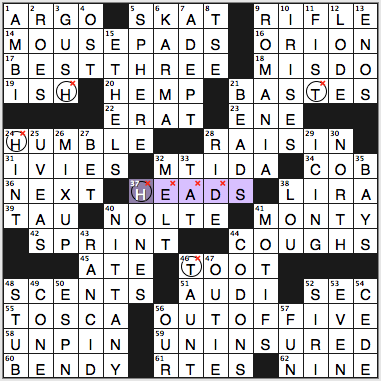 That’s right, HEADS at 37-Across and “H” in each of the five circled squares (“coins”) will work. But so will TAILS at 37-Across and “T” in each of those circled squares. In this particular design, then, that’s eight squares doing double-duty, meaning there has to be thirteen clues that can work both ways. I can tell you from my own efforts that this ain’t easy. A Schrödinger puzzle succeeds or fails on how well the clues fit. You can probably come up with a common clue for any two answers that share all but one letter, but most of them will be pretty lousy. CLOUD and ALOUD, for example, can both be clued as [It rhymes with McLeod], but yeesh that’s ugly. But look at how well the clues work here. [It may be landed with a hook] is nice for both FISH and FIST. [Antagonize] works beautifully for RIDE and RILE. [Bring down] suits both HUMBLE and TUMBLE quite well. So yeah, this one succeeds. And then! Since April 1 was a Tuesday, the grid couldn’t have obscure entries. It still had to be accessible to newer solvers, the ones who normally quit long before reaching Thursday, the unofficial day for gimmick puzzles. Despite all the design constraints here, only ERAT, MT IDA and UVEAS seem slightly out of place for a Tuesday grid. Maybe ROES too? Meh, we’re quibbling now. The bigger point remains: this was the best Schrodinger puzzle of the year and maybe one of the best ever. Fireball Crosswords subscribers happily await his annual Something Different puzzle (re-branded by Fireball as the “Cuckoo Crossword”), and this year’s version lived up to our high expectations. Look at that grid! It sports just 54 answers. Yes, most of them are fabricated and silly, but it still works smoothly despite all the open space. And between the goofy entries and the playful clues, you can’t help but have a good time. 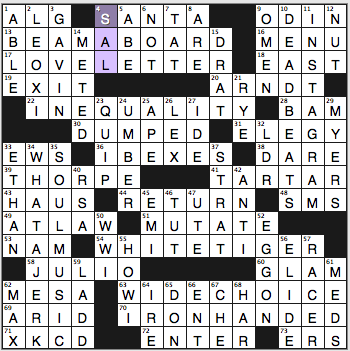 My favorite clue/answer pairs were [” “] for MIME QUOTATION and [Resembling a person on a horse] for the 15-letter EQUESTRIANESQUE (the latter is something of an inside joke, but it’s always nice to see a new -ESQUE term in a Cuckoo Crossword). This puzzle received 13 star ratings from readers (none lower than 4.5 stars), for an impressive 4.73 average. Even by Something Different standards, this was an achievement. Click Language, by Ben Tausig (Inkwell Crosswords, May 14). 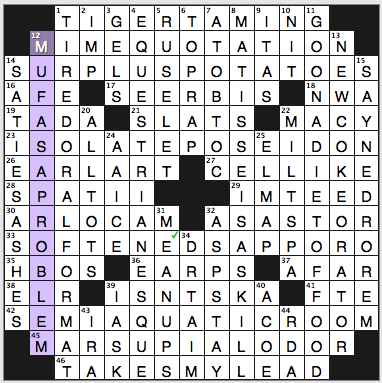 The clue for MORSE up there at 5-Across gives away the gimmick early on: [Inventor whose name is spelled out by the horizontal lines of special characters in this puzzle]. Right away we know there will be dots and dashes in the puzzle, but this isn’t your typical rebus gimmick. For one thing, the DOT and DASH symbols are used only in the Across entries (they are just omitted in the Downs). For another, the dots and dashes are confined to five rows (namely rows 3, 6, 8, 10, and 12). If you read the dots and dashes across these rows, they spell letters in Morse Code. But not just any letters–as the clue to 5-Across states, they spell M-O-R-S-E from top to bottom. For example, the two dashes in the third row (from DASHIKI and DASHING) make an M. Then, in the sixth row, the three dashes in SLAPDASH, DASHER, and SODA SHOP give you an O. Three rows later, you have your MORSE! Some of the dot/dash entries were stellar, like the SODA SHOP and LET’S DO THIS. Plus you have BAR-HOP, GO VIRAL, ORBITZ, and COIN-OPS among the fresh nonthematic fill. Best of all, we finally have a crossword that uses DOT and DASH for Morse Code instead of that annoying DIT and DAH we (too) often see. Some commenters were befuddled by the dots and dashes working only in the Across entries, leaving those squares meaningless for the Downs, but obviously it didn’t interfere too much with their enjoyment: our readers gave the puzzle 11 five-star ratings and a superb 4.68 average. Spirituals, by Caleb Madison (American Values Club Crossword, October 29). You can’t tell from the screenshot, but ELVIS is hiding in that line of five black squares in the fourth row and TUPAC is behind the line of five black squares in the twelfth row. How do we know? Two reasons. First, the puzzle’s instructions state that “The puzzle below is haunted by two figures who were so great live that many refused to believe they could ever join the choir invisible. Can you catch them?” Elvis and Tupac fit that bill, no question. Second, each of the Down entries abutting those black squares is clued in an unusual way. The clue for 4-Down, for example, is [(Possible) g(o)al of s(h)o(ppi)ng]. If you ignore the parenthetical material, the clue is [gal of song], which works for SAL. Now consider the parenthetical material and the clue reads [Possible goal of shopping]. That works for SALE. (E, the last letter, can go into the black square beneath SAL.) Repeat this approach for next four Down clues (ABE/ABEL, NOT/NO TV, TAT/TATI, and ARE/ARES) and pretty soon you have ELVIS spelled out in the black squares. The same trick works for TUPAC down below. la)y(ers that’s a hallmar)k (of ballet danc)ing] for TUT and TUTU and [(Smoke without damaging one’s) lu(n)g(s, perhaps)] for APE and VAPE. Note that these strange clues were used 20 times in this puzzle, since each five-letter dead man had to work for both an answer above and an answer below. For extra elegance, DEADBEATS and SOUL MUSIC also appear in the grid. With all of this thematic material, the grid must be choppy and full of junk, right? Wrong. ALG and EWS is as bad as it gets. This is such a novel way to use the dual-purpose cluing gimmick, all in service of a theme that was perfectly suited to Halloween and to the AV Crossword Club vibe. This baby landed 30 five-star ratings from our readers and an impressive 4.65 average (the same chucklehead, or perhaps a different one, gave this puzzle 1.5 stars too). Commenter Brucenm had this to say: “As someone who has occasionally bitched about Caleb’s puzzles, I join the chorus in singing that the complexity and multidimensionality of this one was fantastic.” One does not use 19-letter words of praise lightly. Untitled, by Trip Payne (New York Times, November 1). Trip’s second nominated puzzle in this category was a personal favorite. Readers liked it too, with 24 five-star ratings and a 4.6 average. We don’t often see themed puzzles on Saturdays, but on this weekend we were treated to a 17×17 themed puzzle. The puzzle was supposed to have been the dreaded Puzzle #5 at that 2014 ACPT, but because the solution had been leaked inadvertently during a videotaped interview the puzzle had to be pulled from the lineup. The silver lining to the story was that so many more solvers got to enjoy the challenge posed from such a terrific puzzle. A quick glance at the grid suggests there’s nothing really gimmicky about the puzzle. The four theme entries have math problems instead of traditional clues. 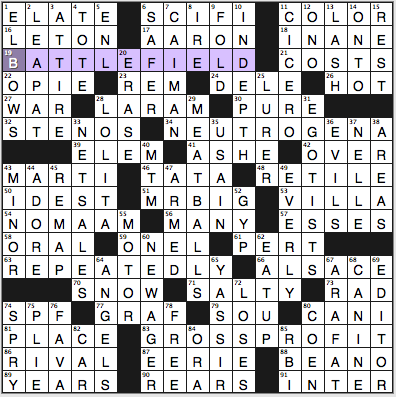 BATTLEFIELD, e.g., is clued as [81 ÷ 27]. Wait, shouldn’t the answer be 3? Well no, because the numbers refer to grid entries. The answer at box 81 is PLACE and the answer at box 27 is WAR. So the clue is really [Place divided by war]. Isn’t that just about the coolest thing ever? NEUTROGENA is clued as [61 + 86], which translates to [Pert Plus rival]. REPEATEDLY is clued as [56 x 42], which becomes [Many times over]. And the clue for gross profit is [33 – 21], or [Net sales minus costs]. Each basic math operation is used once, and for all but subtraction the math symbols are used in a non-mathematical way. While the puzzle appears to have four theme entries, in fact there are twelve. That explains the larger grid. (Okay, what really explains it is that ACPT Puzzle #5 is usually 17×17.) Sure, the shorter words aren’t placed symmetrically, but remember that in order for this concept to work, the answer had to start in a numbered square where the number fed only an Across or Down and not both. Thus, for instance, none of the words could be at 1-Across since there’s also a 1-Down and solvers would be confused as to which one was used in the theme clue. Befitting what would be a challenging tournament puzzle, this one had some tricky clues. [Bee relative] doesn’t scream black-and-white TV until you remember OPIE’s Aunt Bee. And there was [Cut from a log] for ERASE. And perhaps everyone’s favorite, [He is one] for ELEM, since helium is an element. I guess in many ways, this puzzle was a gas. Untitled, by Andrew Reynolds (New York Times, April 1)! It’s hardly surprising that this was a Puzzle of the Week winner over at xwordinfo. And given the construction feat, it probably should not be surprising that it received 39(!) five-star ratings from our readers (a 4.66 average based on 63 votes, brought down a touch by one chucklehead who gave it 1.5 stars). Rex Parker was out on April 1, but fellow Fiend Andy manned the helm that day. His comments on the puzzle are apt: “This is an extremely impressive construction. 78 words and 40 blocks are reasonable numbers for a Tuesday puzzle. Of course the gimmick would be much better suited for a Thursday puzzle, but it’s a fantastic April Fools’ puzzle. And the theme is really the star here: the surrounding fill is fairly unremarkable, about on par with or slightly better than with most other Tuesday NYT puzzles. * * * Given how difficult this grid was to build, ‘unremarkable surrounding fill’ is a huge accomplishment.” Indeed, it’s Orca-worthy. Congratulations to Andrew and to the other nominees for such creative puzzles. More, please! This entry was posted in Orca Awards and tagged Andrew Reynolds, Ben Tausig, Brendan Emmett Quigley, Caleb Madison, Matt Jones, Trip Payne. Bookmark the permalink.